As I mentioned in this month’s Letter from the Editor, this flamboyant color is more polarizing than most – people tend to love it or hate it. There’s something about that notion that makes us love this color even more because, as you know, we’re all about living a bold, colorful life, and when you live bold you also live confidently and self assured. Whatever your feelings about the color orange, there’s no denying that orange is one of the most dynamic colors out there. It’s a combination of red, which is bold and powerful, and yellow, which is joyful and happy. It’s attention grabbing, stimulating, and vivacious. And for all those reasons and more, orange is a color worth investigating further. So, let’s dive into everything about the color orange! 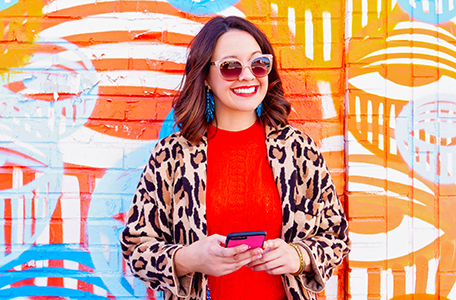 Whether you’re wondering about the history of the color orange, what color goes well orange, how to style an orange dress, or anything else about the color orange, we have ya covered! The term ‘orange’ was first used in the 1500s, and it was taken from an Old French word ‘orenge,’ which was in reference to the fruit of that same color and name. Orange is the easiest color to see in low / dim / dark lighting. This is why life jackets, life boats, traffic cones, and other safety related items are typically this hue. The color has been known to be a popular one in restaurants to encourage the feeling hunger and contentment. It’s an appetite stimulator. In Feng Shui, orange represents fire. Biblically, orange is associated with saints and represents strength and courage. Nobility were the only ones during the Elizabethan Era who could wear orange. Some facts found via Ten Random Facts, Bourn Creative, and The Fact Site. 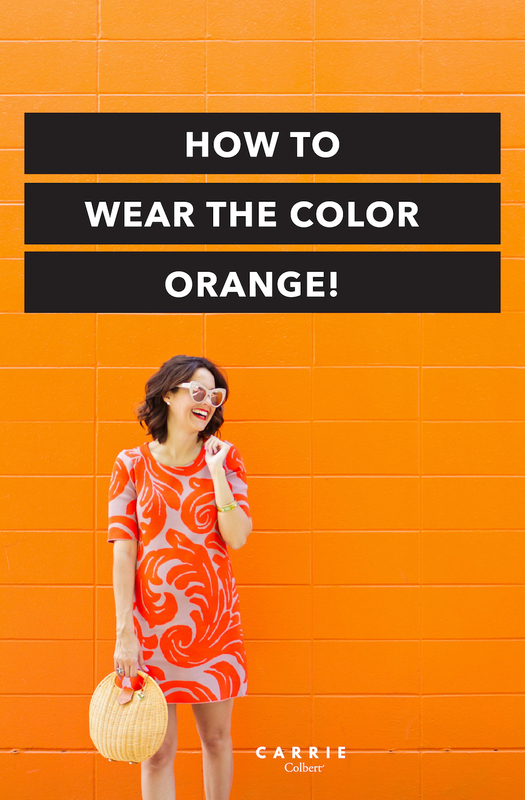 Now that we’ve discussed the meaning behind the color orange, let’s talk about what we’re all here for today…how to wear the color orange! 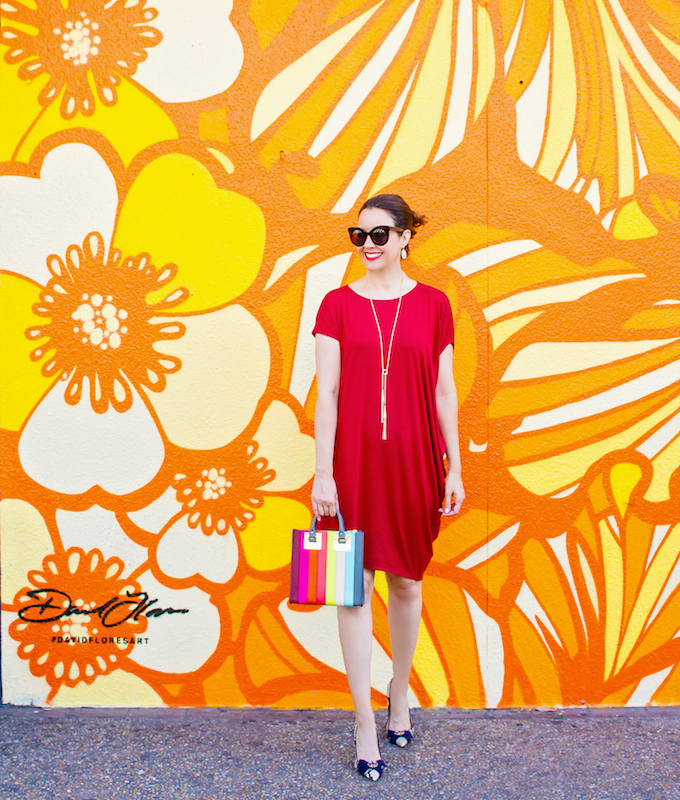 I’m sure you recall our article on creative ways to wear burnt orange (if not, check it out here! ), but as you can see, now we’re talking all about orange from ROYGBIV. Orange and gold is an elegant and beautiful combination. When wondering what jewelry and accessories to pair with this vivid hue, opt for gold over silver. It adds a richness and complements the color incredibly well. As well, consider an orange skirt with a gold top, perhaps (or vice versa). This is also a great combination if you’re still a bit hesitant about wearing orange because you can partner it with a neutral such as gold rather than something else bold. Along the same lines of wearing orange with gold, pairing the color with denim is also another way to “ease” into the world of orange. Whether an orange sweater or top or jacket or even one with another color, such as Carrie’s above, throwing on a pair of jeans with it is a no brainer and always cool. 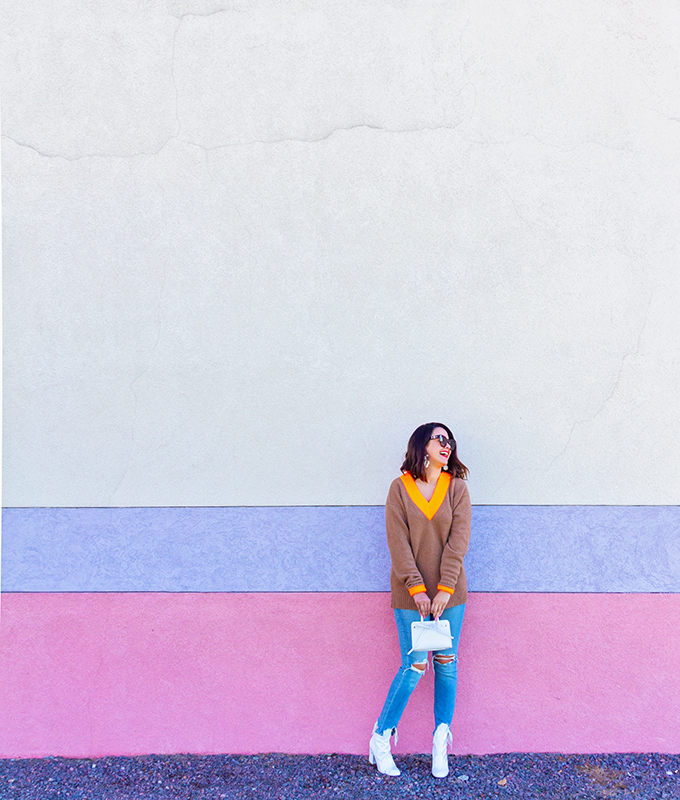 Now, if you’re ready to dive in head first or you’ve already dabbled with denim and gold, as mentioned above, and are ready to take a bigger leap, pair your orange with bright pink. It’s nothing short of feel good fabulous and totally bold and stylish. Bottom line, it’s fun! When it comes to mixing prints with orange, we immediately jump to leopard. The tan and black shades pair perfectly with orange. 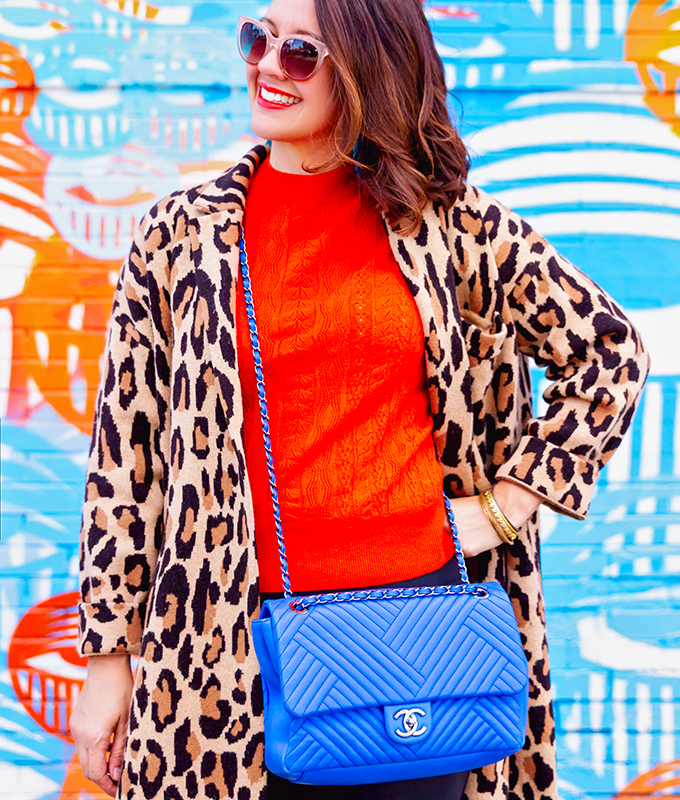 The colors in a leopard print are neutral, so leopard can really be seen as a neutral, and for that reason alone, it’s a show stopping combination. Orange and blue are complementary colors, and thus, they of course look great together. 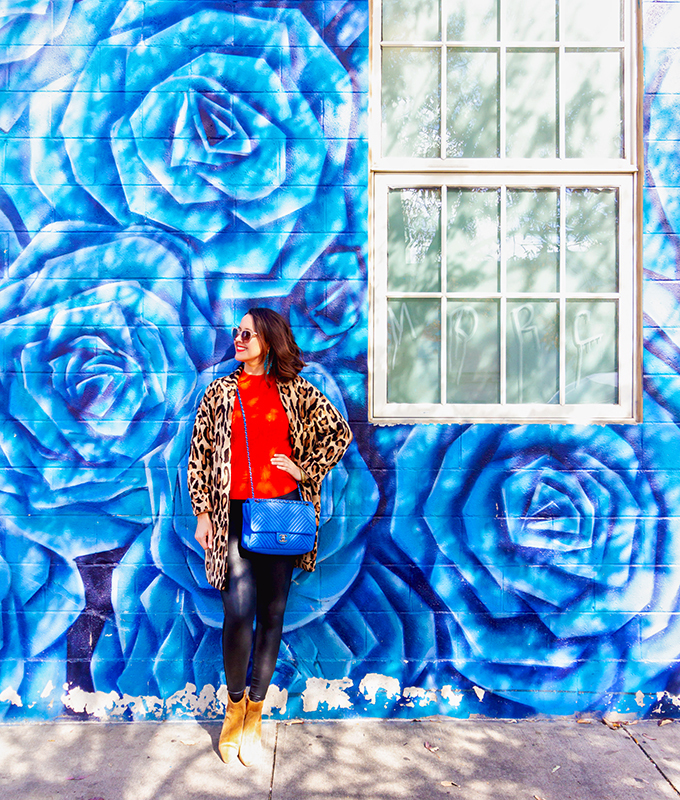 Above Carrie wore her bright blue bag as her added pop of color, and it makes the perfect statement. These two colors balance each other out so well, and we have fully embraced this pairing. Orange you glad you read this article? Sorry – lame joke! But seriously though we hope you found these tips on wearing the color orange helpful. 1. What are your thoughts on orange? Love it? Hate it? Let us know in the comments below. 2. Be sure you’ve checked out our Color of the Month boutique with even more of our orange favorites (apparel, accessories, home decor, and more). 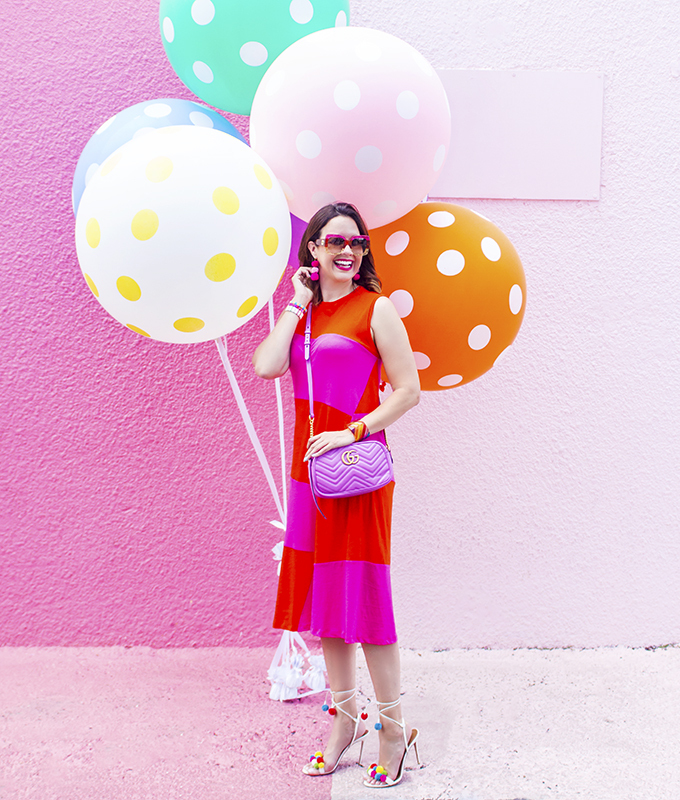 Love your post & ideas about my favorite color!!!! Great examples of how to pair it with other colors & patterns. Especially the leopard. Both are my go toos. I love this……the options are fab!!!! Thanks so much for saying that, Mary! And one of our current favorite pair of booties is the perfect example.